I am shocked and insulted to not have been included on your list of American Islamophobes. There is no doubt in my mind that I should appear in Category 1, “The Seed Planters”, along with those such as Bernard Lewis, Daniel Pipes, and Steven Emerson, to whom you attribute what you believe to be the most evil possible motivation: Zionism, which even precedes religious bigotry, greed, and racism on your list of evil motivations. My suggestion for you, is that first you read “Zionism — what it is and isn’t” so that you can use the word correctly and stop appearing to be antisemitic fools (I don’t think you can actually stop being such, but appearances are important). 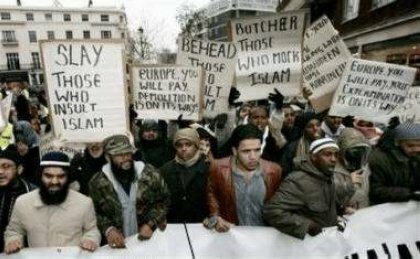 Finally, you can learn that “Islamophobia” (which properly should mean ‘fear of Islam’ and not ‘prejudice against or hatred of Muslims’ as you use it), is almost entirely a reaction to the violent and often murderous behavior of some Muslims — and to the approval granted that behavior by most Muslims. You can’t have it both ways — you can’t reject Western values of free expression and tolerance, and then accuse those who point this out of racism or bigotry. If you can’t do any of this, then please put me on your list, along with Lewis, Pipes, and Emerson. I’d be in good company. This morning, NPR featured a story about how the Palestinian economy is being ruined by ‘the occupation’. Checkpoints and roadblocks, Israeli restrictions on where Palestinians can build roads, etc., have made economic development impossible. The Palestinians are miserable and it’s Israel’s fault. One might think from the report that the checkpoints, etc., have been there since the beginning of the occupation in 1967. But of course this isn’t true. Most of these were put into place as a direct result of the upsurge in terrorism that began in 2000 with the beginning of Arafat’s intifada. These impediments wouldn’t be there if they weren’t necessary. Does the Israeli government enjoy the constant condemnation in the press and the UN? Wouldn’t it like to make the Bush administration happy? Does the average Israeli male under the age of 40 open his mailbox and say “great news — I’ll be away from my family and my job for 30 days so I can harass Palestinians at checkpoints”? Although pro-Palestinians scream when I say it, all they have to do is stop terrorism and these will go away. Now let’s look at the Palestinian economy. Much money has been given to the Palestinians over the years for development of infrastructure for a state and an economy. In the days of Arafat it went mostly into his and his friends’ Swiss bank accounts, or was used to purchase weapons and explosives. Although Palestinian Prime Minister Salaam Fayad seems to be committed to development, the Fatah organization is still a confederation of gangs and clans who allocate funds according to nepotic principles. Even money which is allocated ‘legitimately’ mostly goes to support the ‘security’ forces, the army which the PA would like to build to confront Israel (oops — “fight terrorism”). And this is the West Bank. In Gaza, Hamas receives large amounts of funding from Iran and other supporters, and spends it on stockpiling arms and building fortifications. The rocket business is booming! But a large part of Gazans’ income came from workers who crossed into Israel, and this has been ended as a result of terrorism — especially including attacks on the very border crossings that they used, forcing them to be closed. And a discussion of Gaza would not be complete without mentioning the greenhouses built by the expelled Jewish settlers, which were purchased by Jewish donors in the US and turned over to the Palestinians — and then torn to pieces by them. Another aspect of the Palestinian economy in both the West Bank and Gaza is the ‘refugee economy’. There are about 1.7 million Arabs who claim refugee status living in Gaza and the West Bank. They receive aid from UNRWA, the huge organization created by the UN to maintain the refugee population. UNRWA has 27,000 employees, almost all ‘refugees’, and 10,000 of them work at its Gaza headquarters. The primary goal of the Palestinian leadership, from the Mufti through Arafat and including the present leaders of Fatah and Hamas has never been the welfare of Palestinians. First priority has always been the destruction of Israel and the removal of the Jewish presence from ‘their’ land. And as we’ve seen in the case of the refugees, they have always been prepared to sacrifice their people to advance this goal. The organization which calls itself “J Street” is billed as “pro-Israel and pro-peace”. It presents itself as an alternative to AIPAC, which it says is dominated by the “far right”. It appears to be very well-funded and has numerous well-known liberal Jews among its supporters. In fact, J Street’s goals are inimical to the continued existence of the state of Israel. Its supporters either desire the elimination of the Jewish state or do not understand the consequences of accepting its principles. Here is J Street’s Statement of Principles, with my comments. “Engagement” is a code word for pressure on Israel to make concrete, irrevocable concessions — giving up territory — in return for unenforceable promises of peace and normal relations. Whenever the US has been “engaged” — after the 1967 and 1973 wars, the Israeli-Egyptian ‘peace’ deal, the 1982 agreement that let Arafat and his terrorists escape Beirut, and of course Oslo — Israel has been forced to give up gains earned in blood in return for promises, both from the US and the Arabs, that were not fulfilled. This paragraph makes two points: Israel is the “homeland of the Jewish people”, but not a Jewish state; and it only promises, but does not provide, equal rights for all of its citizens. In order to understand the importance of the juxtaposition of these statements, we need to consider the demands presently being made by the elite of the Israeli-Arab population: their understanding of ‘equal rights’ essentially calls for the elimination of the Jewish character of the state. For various reasons, including the lack of support among Palestinians for any non-rejectionist leadership, majority support for Hamas, and the military capabilities of the Iranian-funded and armed Hamas, a peaceful Palestinian state simply impossible. A fantasy. If we ignore this and create a state anyway, we will be helping set up a terrorist entity like today’s Gaza strip right next to Israeli population centers. Another fantasy. Giving up the Golan heights will drastically reduce Israel’s deterrent against Syrian attack, allow renewed terrorism on what has become a quiet front, allow Hezbollah to grow even stronger. In return, Israel will get less than what she got from Egypt, not even a prolonged cease-fire. The Arab (Saudi) Initiative is a surrender document. It requires Israel to return to the 1967 lines with no exceptions and the expulsion of hundreds of thousands of Jews from their homes; it calls for a solution of the refugee problem in a way which can only be understood as their return to Israel; and Israel gets nothing until she has entirely met Arab demands. The Arab initiative directly contradicts J Street’s planks calling for land swaps and for refugees to return to the Palestinian state and not to Israel, so one wonders what it’s doing here. An American policy in the Middle East more broadly based on diplomacy, multilateralism and real partnership with the European Union, the Quartet and others. We support dialogue with a broad range of countries and actors, including Iran, over confrontation in order to find solutions to the region’s conflicts. The European Union and the Quartet members other than the US (Russia, the EU, and the UN) are all quite hostile to Israel. How does involving them help? And what exactly does J Street propose to offer to Iran in order to ‘find a solution’ to Ahmadinejad’s desire to replace US influence in the Middle East with a Shiite Caliphate? Permission to build nuclear weapons? To advance these goals, we seek to build a broad and inclusive campaign that crosses ethnic and religious lines and in which American Jews play a prominent role. Yes, it really helps the argument when you can say “See, even the Jews think Israel is intransigent and must be forced to make peace”. We believe honest discussion of American and Israeli policies is healthy for the U.S., for Israel and for the American Jewish community. We will actively promote debate in the United States that is as open and spirited as it is in Israel. In other words, Mearsheimer and Walt were right, AIPAC and the Israel Lobby ‘muzzle’ debate about Israel in the US. In that debate, we will oppose alliances with the religious right or any radical religious ideologues in the name of supporting Israel as well as efforts to demean and fan fears of Islam or of Muslims. It’s interesting that on the J Street site, there is no mention of any of the real threats faced by Israel from Hezbollah, Hamas, and Iran. No mention of the tens of thousands of Syrian and Hezboillah missiles targeting Israel at this moment, no mention of the liklihood of war with Hezbollah and Hamas. What we find instead is an attack on Christian Zionist John Hagee! Does J Street think John Hagee is a greater menace than Nasrallah and Ahmadinejad? The statement of principles is not in any way pro-Israel or pro-peace. It is a blueprint to force Israel back to the indefensible 1967 borders and to entirely surround her with armed terrorist entities that will continue to build up their military capabilities with Iranian funding; it encourages the radical elements among the Israeli Arabs in their struggle to turn Israel herself into a Palestinian state from within; it promotes the completely unacceptable Arab Initiative; suggests that dialogue is the way to deal with imminent military threats; makes approving noises in the direction of the antisemitic doctrine of Mearsheimer and Walt; and tries to drive a wedge between Israel and the 100+ million evangelicals in the US who want to support her. The consequence of allowing a Hamas state to be set up in the West Bank and of failing to firmly oppose Iran and her proxies, to weaken Israel and strengthen its enemies cannot possibly be peace, but its opposite. The primary goal of J Street appears to be to get Israel out of the territories, even though there is no partner which could create a peaceful Palestinian state. Secondarily it opposes the Jewish character of the state. Its domestic goals in the US are to reduce the influence of the Christian right and to keep Jews from making alliances with right-wing forces. J Street is just another part of the general offensive against support for Israel in the US that has been taking place for the past few years. This one is aimed at support from liberal or uncommitted Jews, just as Jimmy Carter’s book is designed to weaken pro-Israel sentiment among Protestants. It would be very interesting to learn the sources of funding for this slick group’s disingenuous propaganda. Rabbi David Saperstein, director of the Union for Reform Judaism’s (URJ) Religious Action Center has been a subject of my posts in the past. For example, last December he sent around a solicitation for funds to members of URJ congregations in which he listed the greatest challenges facing us as Supreme Court nominations, civil rights protections for gay, lesbian, bisexual, and transgendered people, climate change, the international health care crisis, and finally the Middle East conflict. Without denying the seriousness of the other ‘challenges’, it seemed strange that a solicitation from a Jewish organization would put the life-and-death struggle of Israel last, and not even mention resurgent worldwide antisemitism. I also felt that his preferred approach to the Israeli-Arab conflict — “U.S. efforts to help craft a two-state solution” — was the worst possible that wasn’t explicitly pro-Arab. What he seems to be saying is that a purely religious belief — or a moral principle that is based on it — is by definition not a legitimate premise in a sound argument. A “faith statement” for Saperstein is something subjective, a matter of taste like “I like spaghetti” which doesn’t necessarily apply to anyone else. Indeed, although he allows for ‘influence’ I suspect that he would find a candidate’s statement that his Catholic background influenced him to oppose abortion unacceptable; ‘influence’ is probably allowed only in statements like “my religious background influenced me to be honest”. In other words, for Saperstein, religion is not an acceptable source for the moral principles that guide our reasoning about moral questions, although religious training or belief can help create a person’s character. But obviously everyone that ever makes moral decisions has such principles. Saperstein obviously has them himself, or he wouldn’t be able to see the need for gay rights, for example. He just doesn’t want them to come from religion. You get the idea. USH is a moral system, a collection of premises that can be the basis of a moral argument. But there are other moral systems — an Orthodox Jew might choose the Shulchan Aruch, for example — and there is nothing especially privileged about USH. But the fact that it is unexamined means that its practitioners often do not understand this, and they can be quite doctrinaire and even self-righteous — like Rabbi Saperstein.